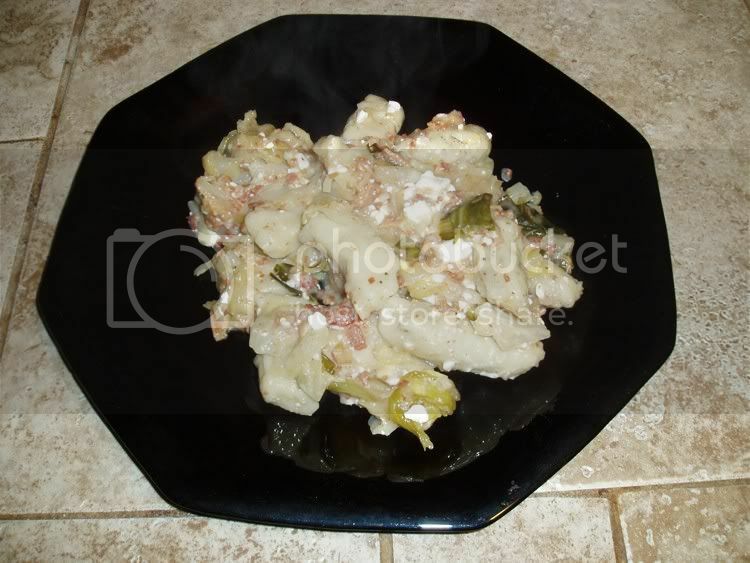 Peasant cooking, which is to me the best food in the world, can and will often vary between regions, between villages and even between individual homes; consequently, there are many versions out there under various spellings: halušky, haluski, halushki kapusta, halushky with pot cheese. These are all sure to be good, but they are NOT Grandma Mary's halušky recipe; this one is! 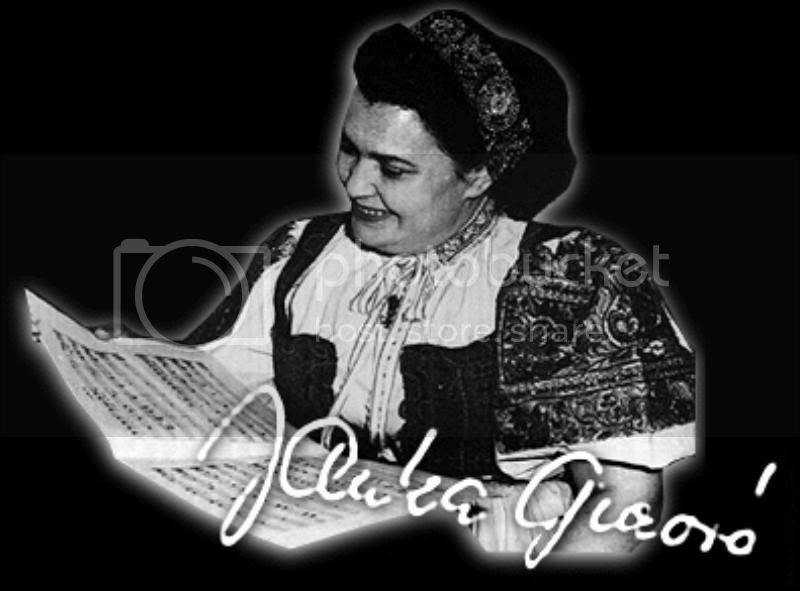 This pictorial is part of a series that I am compiling in her honour, which includes her holúbky (cabbage rolls), her Veľkonočné syr (Easter cheese), and her koláče (poppy seed or walnut rolls). Naturally, many of those memories revolved around food and mealtimes, which are always happy occasions for any family. 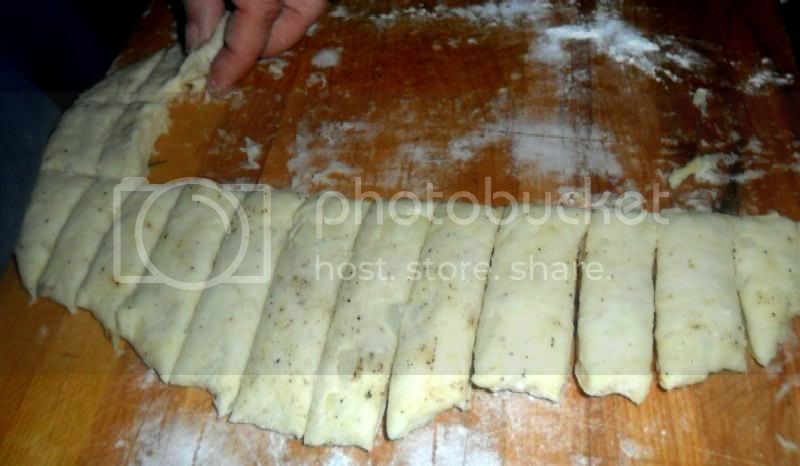 Some of those foods have already been shared here, such as her koláče, her holubky and her hrudka (sometimes called sirets or "Easter cheese"); this recipe, simply called halušky, is another. The folk of Žakarovce are peasants, humble and close to the land, and this meal is so eastern-european peasant, grandma-in-a-head-scarf-digging-for-potatoes-out-behind-the-cottage that you won't believe such goodness can come from the earth. I shall say to each and every one of you: I COMMAND you to try this! 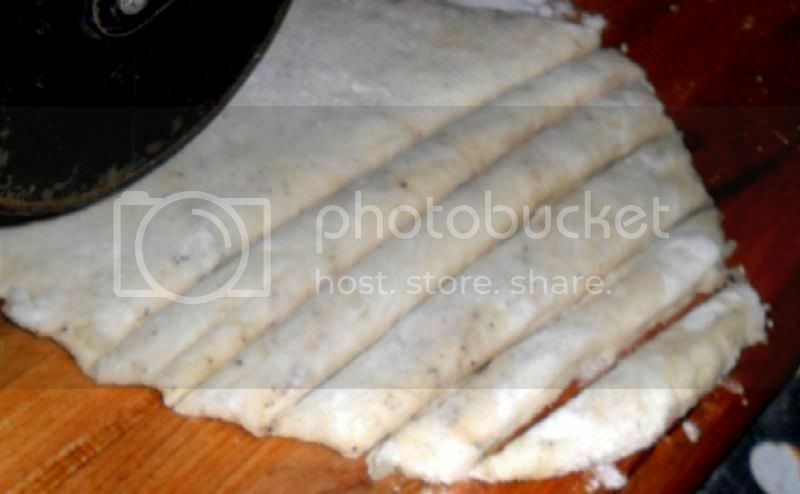 As the name states, this recipe is for halušky with cabbage or curd cheese (cottage cheese). My wife was very definite on this: when it comes to her grandmother, she only saw her make halušky with cabbage OR cottage cheese. In her family, it was never halušky with cabbage AND cottage cheese. 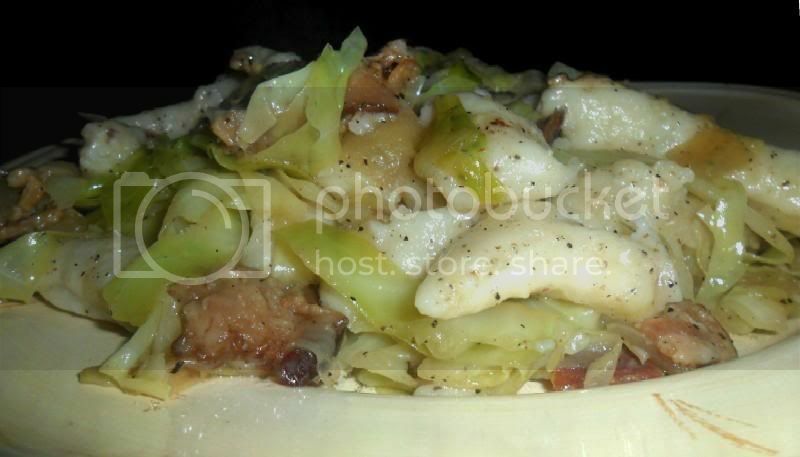 Having said that, i am sure that in some household somewhere in Slovakia, it was made with both cabbage and cheese. So, there seem to be three options to this: with one, with the other or with both - the choice is up to you! This preparation will be with cabbage, but I will try to make the other options clear. 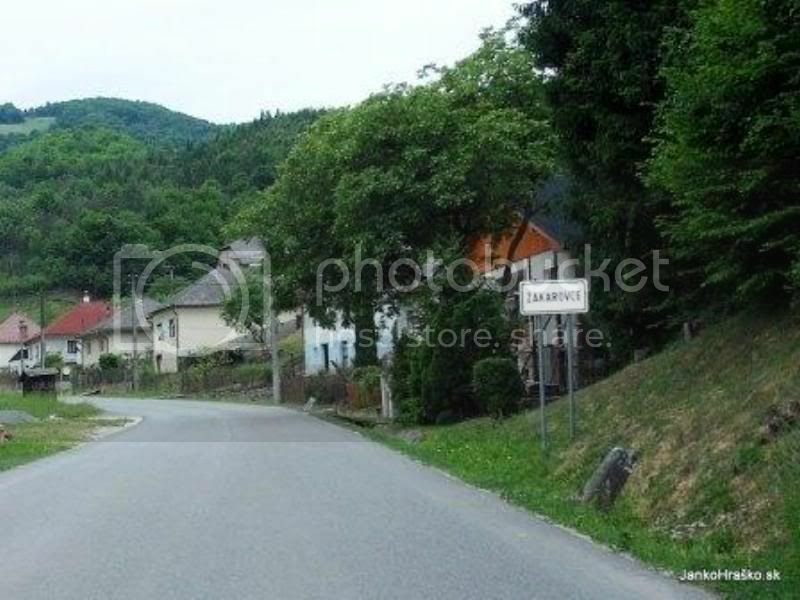 So, what are halušky? It's very simple and nothing elaborate: halušky are simply halušky - a cross between home-made noodles and potato dumplings that are made from flour, potatoes and egg. 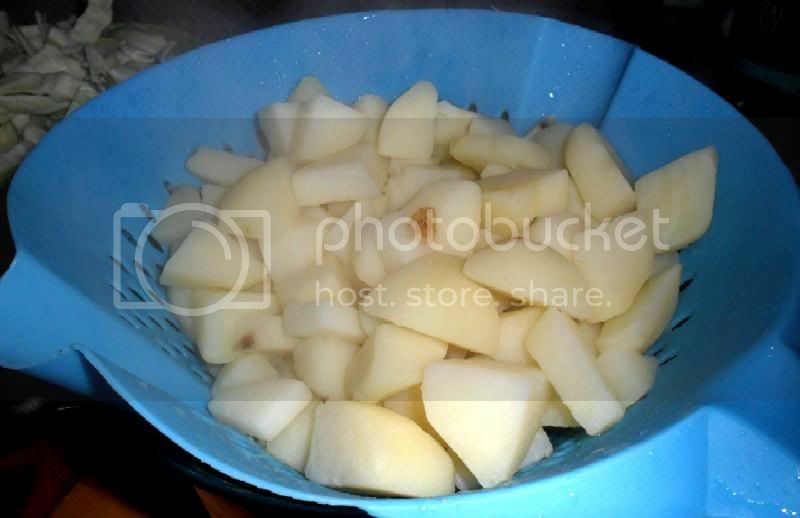 In their simplest form, they are boiled with soup or stew; or they might be boiled in water, drained and served as a side dish - however, this preparation goes a step farther, as you shall see. A lexicological note: as far as my research indicates (and i admit that i might be a bit wrong), the difference between haluski, as they are often spelled, and halušky is simple geography. It seems that the "I" on the end indicates more of a Polish and/or Ukranian origin, while the "Y" at the end points to Slovakia and possibly Russia; also, the little squiggle over the "S" (š) indicates that it should be pronounced with a "sh" sound, as in "halushky." The plural form is "halušky;" the singular form is "haluška." If anyone who is fluent in Slovak sees that I am wrong with any of this, please let me know, either by emailing me or by replying to this thread. That's it! 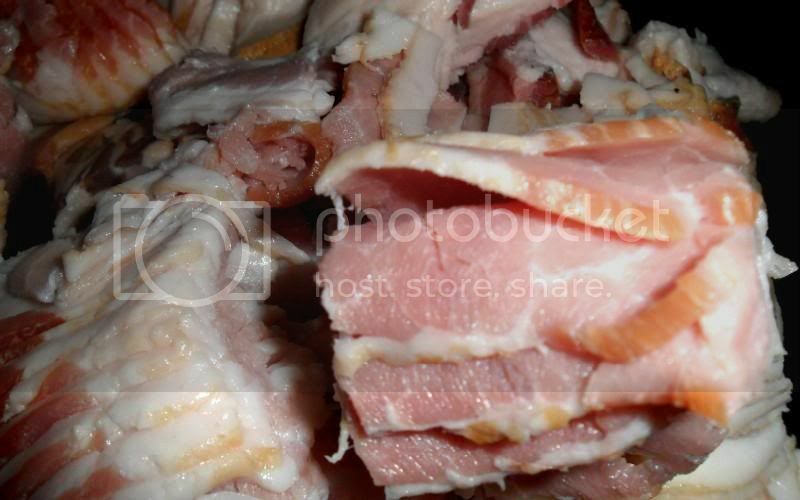 Keep in mind that this is going to make a lot of halušky; as always, you can cut this in half for a smaller meal. NOTE - In the picture, I have low-fat cottage cheese, simply because that's what we had on hand. You could use this, I suppose, but large curd, 4% cottage cheese would give you a richer end product and a much better experience. Speaking to cheese, if you have access to a cosmopolitan variety of cheeses, you can use Slovak "byrzdny" cheese, which is evidently similar to mexican queso fresco or greek feta. Back in the old country in the old days, the byrzdny cheese would have been a very authentic item to use on special occasions; for normal, every-day cooking, the family would use home-made pot cheese, which is similar to cottage cheese, yet drier. When I say "cottage cheese" in this post, you can substitute with any of the above. Hopefully, we will someday have a tutorial on making pot cheese! 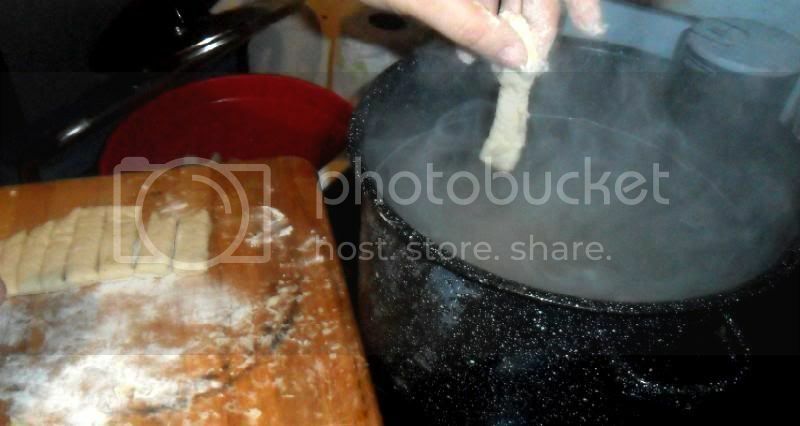 NOTE: If you just want to make halušky themselves, without the cabbage cabbage or cottage cheese, so that you can enjoy them on their own, in a sauce or as a side dish for a meal, then simply skip down to the the sections of this post that go into their preparation. 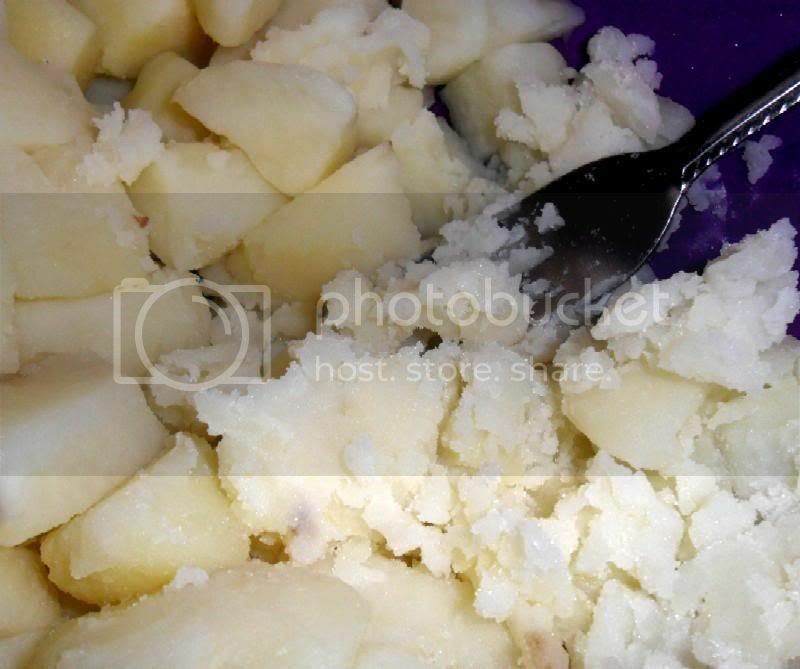 All you need is potatoes, flour, eggs, and perhaps some salt and pepper. 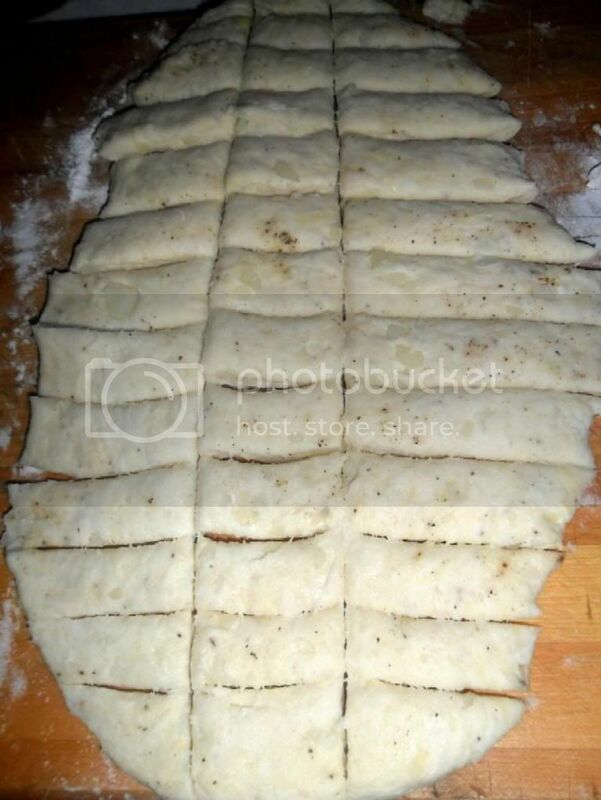 Prepare the dough as described below, then roll it out, cut the halušky, cook them in boiloing water, drain and serve. Here's how the entire dish is made: I will warn you now that I was very thorough with the pictures, to the point of being tedious, but this is a very important recipe in our family and I wanted to be as precise as possible in order to get the method across. I have learned over the years that as we lose our older generation, it is up to the next generation to keep the traditions alive, and this is what I am doing, both here and to a larger extend with this entire website. Much of this can be multi-tasked (for instance, you can prepare some ingredients while others are cooking, etc. ), and when you make this, you will find your own rhythm - especially if you choose to make it again and again; but here, I will lay it all out step-by-step. 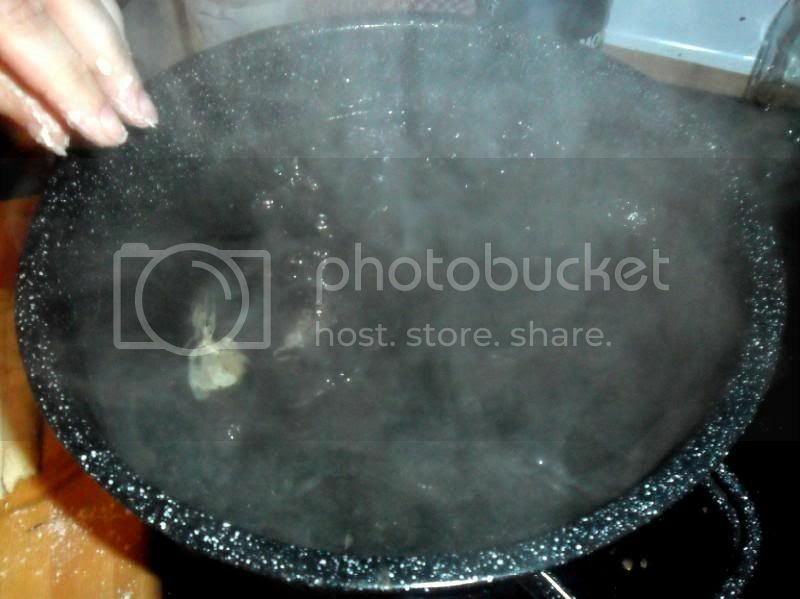 First, Put a large pot of water on the stove and put some heat on it so that it can come to a slow boil. You can add some salt if you want to season the water. If it starts boiling before you are ready, simply reduce the heat and cover it until you are ready. 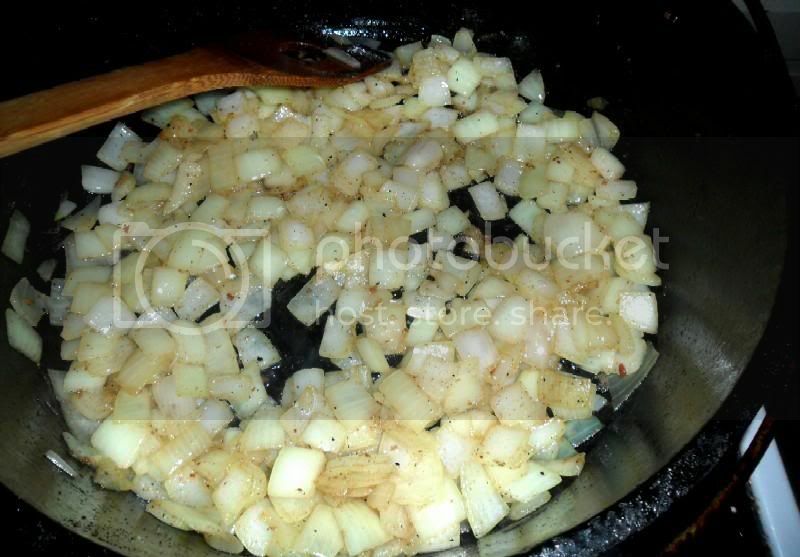 You want a good mix of small and medium pieces of onion, with occasional large pieces. This is not le restaurant de l'hôtel grand de haute cuisine à Paris! 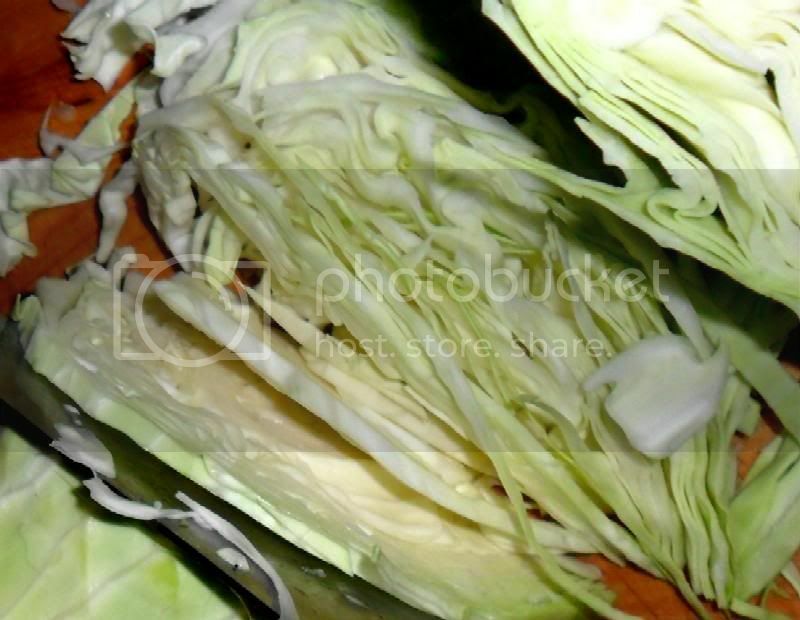 NOTE - Over time, I've found that the best method seems to be quartering the cabbage, then cutting out the cores; then, start at the bottom (where the core used to be) and slice the cabbage quarters very thinly (similar to the picture above), and gradually widen the slices as you work your way up toward the "top" of the cabbage quarter. The final, wider strips from the top will be somewhere between an inch and an inch-and-a-half. you want them in cubes of a similar size as if you were boiling potatoes to mash them, which is pretty much what you're going to do! 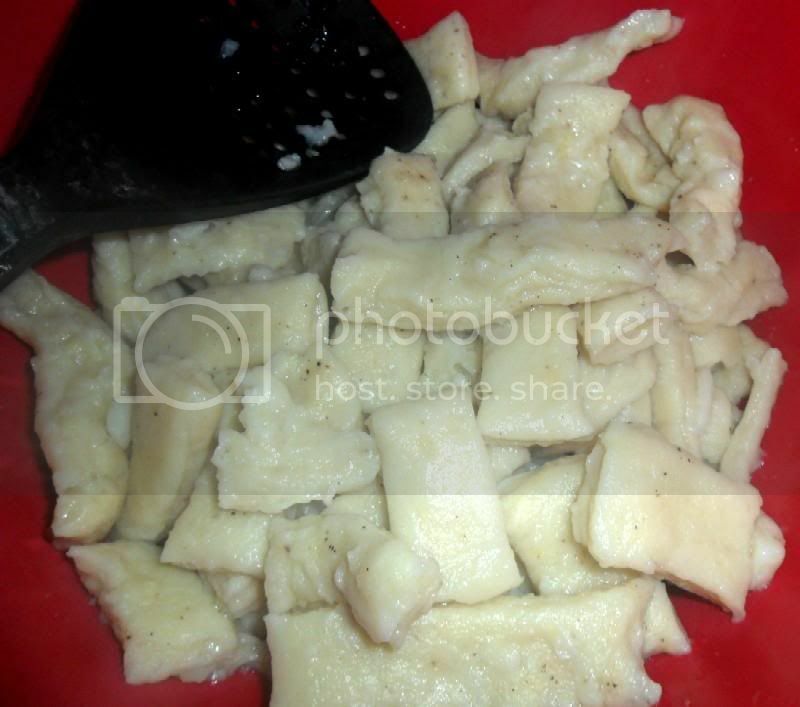 You want them to be very thoroughly mashed, until they have a fluffy texture and there are no visible "chunks," but you do not want them too liquidy or pasty, either. 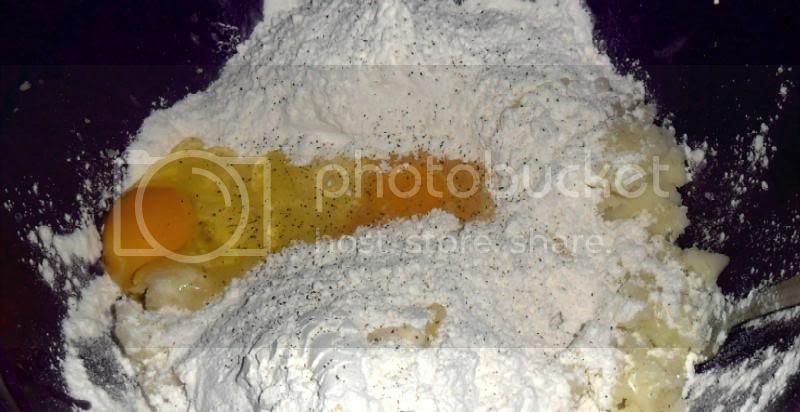 You want it to be fairly smooth and fairly stiff, but not too much so; if you can press it into the bottom of the bowl and turn it out as shown above without it spreading out, you should be good - otherwise, you may need to add a little more flour if it is too soft. NOTE: Since potatoes naturally vary quite a bit in size, I've gotten into the habit over time of selecting an amount that is roughly equal to one "normal-sized" potato per person, then peeling, cutting, boiling and mashing them, then adding the eggs (2 or 3, depending on the amount of potatoes), and then adding just enough flour to bind everything into a good, smooth dough. This method works out pretty much the same as described above, but it is more versatile and allows for variations in potato size etc. Once again, you want to cook them slowly, starting over medium heat, stirring often, until they take on a translucent look and just begin to get some carmelisation. 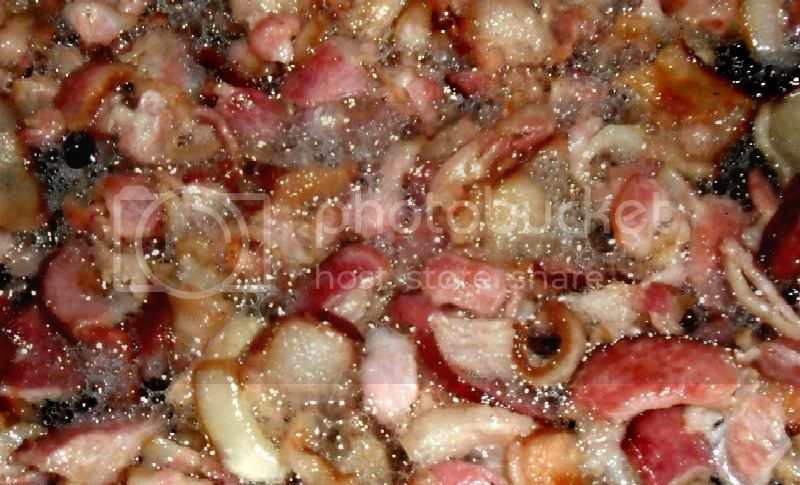 As the onions release their moisture, be sure to "de-glaze" and scrape up all the bits of bacon "residue" that is probably on the bottom of the pan! 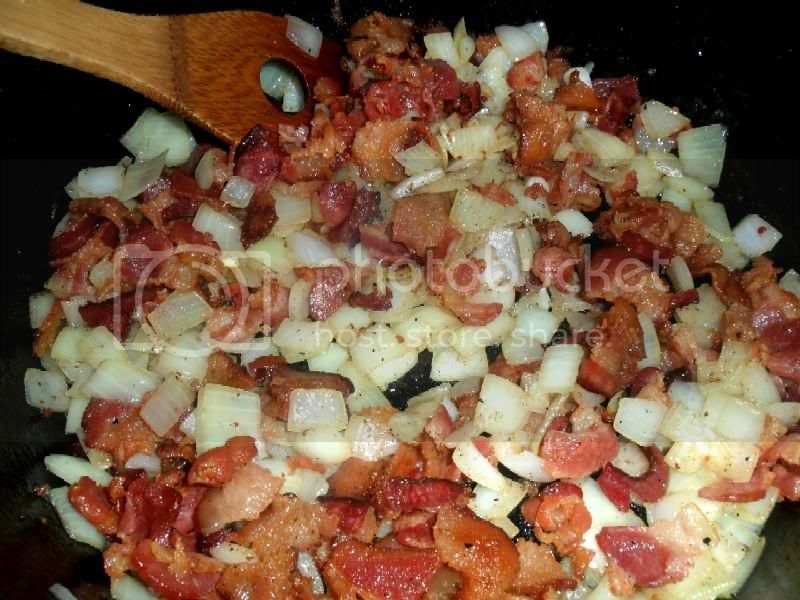 If you are making this with cottage cheese only, then skip this next step; simply maintain your bacon and onions at a low heat, stirring occasionally, and skip down to the making of the halušky. This will look like a huge amount of food in the pan, but as anyone who has cooked with cabbage knows, it will cook down quickly and dramatically. This is why a large pot or Dutch oven will come in handy, but a large frying pan or sauté-type pan should also work well. 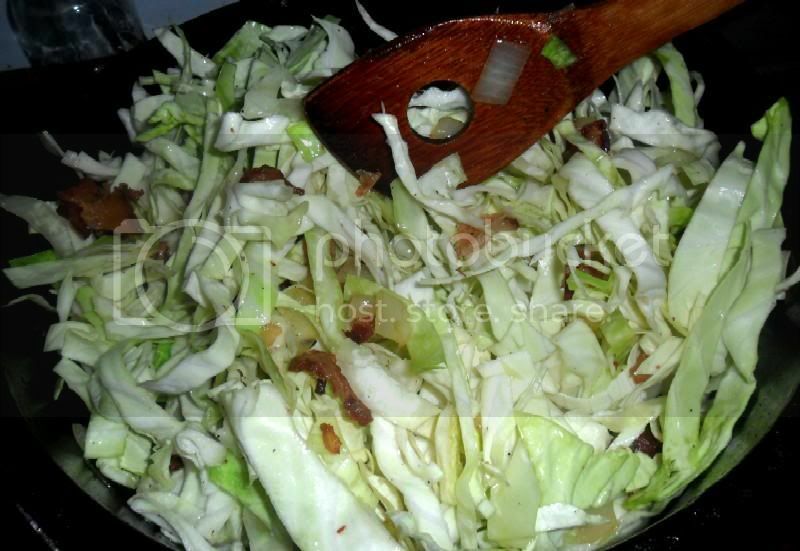 Cook this lovely mixture, stirring often and letting the cabbage cook down. Reduce heat as necessary if it looks like it is going to start burning. 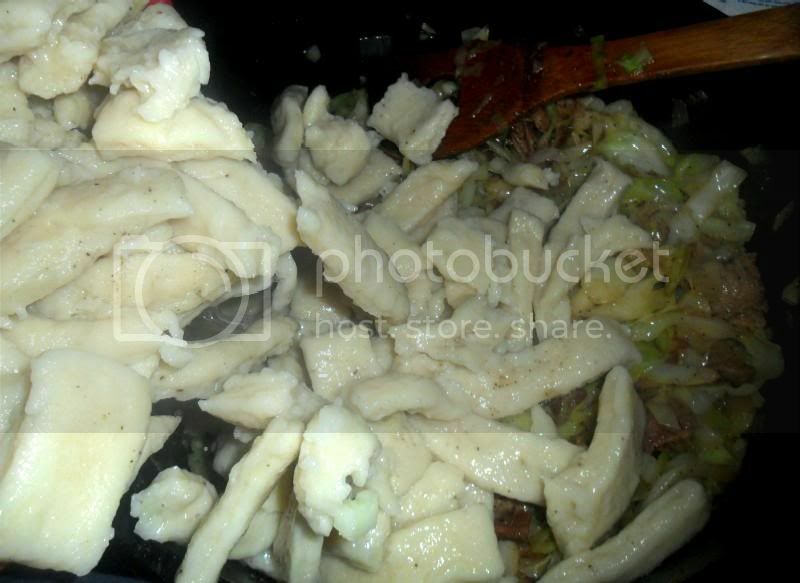 If you did not add cabbage, continue here! Meanwhile, let's get those halušky started! Hopefully your water is at a slow boil by now! You're shooting for halušky that are maybe an inch or two long, no more than three, by an inch or so wide. See my comments above referencing the fact that this is peasant cooking and they do not have to be a uniform, exact size! It's a good idea to drop them into a strainer or colander over a bowl, but not absolutely necessary. Repeat the procedure above as necessary until all the dough is gone. Anyway, back to this wonderful peasant dish! After simmering for a few minutes, the liquids in the pan will thicken up a bit, and your halušky might brown a little, which is perfectly fine. If you're using cottage cheese, now is the time to add it, stirring it into the wonderful mess in order to mix it thoroughly. The potato-based halušky fluff up beautifully when cooked, and the onions, bacon and cabbage work together to provide the most basic and humble, yet delicious flavours. This is very much a meal that comes from the land, and will take you straight to a small, eastern-European village a hundred or three years ago. I can't stress enough how good this meal is, and I will remain forever grateful to my wife's Grandma Mary for bringing this with her from Žakarovce. It is truly one of the best meals I have ever had! Now, as I said before, you are all commanded to go forth and prepare this meal! It is versatile enough that it can be tailored to any taste, and it will certainly be a journey that you will not regret! Holy grail batman....this is going to be made later next week for sure...Thanks for the post Ron. On a side note I just got a Hungarian cook book so I am looking forward to throwing some plates out there for ya as well...Man I just ate but I still want a plate of that stuff. Anything swimming in bacon fat is the best! Man alive I want to try some of that. Great post Ron! hey, guys - thanks for the great replies. this one has great signifigace to me, and i am glad that you were impressed with it. my apologies for taking so long to get this one posted. we actually made this on st. patrick's day, a month ago, but i took a lot of pictures during the preparation and wanted to get the best of them in the proper sequence - also, i wanted to frame it in the right family context, so i needed to ask my wife a few things about her grandmother, and with our schedules that's a challenge. jerod, you will love this, as i know you have a fondness for hungarian food, and this is right up that same alley. looking forward to seeing what you post from your hungarian cookbook - if you get a chance, tell us a little about it in the library section! dave - no reason not to give this a try! keep in mind that the TWO pounds of bacon is feeding a large family - 6-8 people with lunches left over for a couple of days. for a smaller household such as yours, not nearly as much is necessary. i was a little intimidated by the idea, but no worries - once you render out the fat, you're only keeping a tablespoon or three to cook with. enjoy, and if either of you have any questions, let me know! Awesome job, Ron! Great pics and instruction. I like to collect "real family recipes" that have been handed down so this one will go into my cookbook of keepers. Can't wait to try it. you're gonna love it, andy - this one is authentic as it gets. i posted a few before under the "haluski" umbrella, but the ones here really are "the stuff" - an added significance, as you said, is that they are a real, tangible part of our family history. my wife's grandmother was very important to her, and she still misses her these years after grandma mary passed away. my efforts here to keep that memory alive, and to share what she knew, are a tribute to both her and my wife. only start seeing pics after it's all done. Can't think of two ingredients more different. hey, aardvark - good to see you posting! yep, the gnocchi connection is the one i was really interested in. in fact, i will be making gnocchi today using essentially the same recipe with andy's meatballs! i hear what you're saying on the choice between cabbage or cheese, but that's what my wife said. she was very adamant about that, and so i went with it. we did try it once with both, and it was really good, but melissa insists that she only saw her grandmother make it with one or the other, NEVER both. 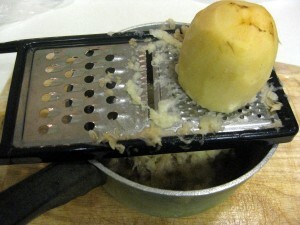 i was talking with another fellow who says that he grates cheddar cheese into his, and that sounds pretty good to try, too! Those dumplings looked pretty good too, I liked the bits of spices you could see in them. Thanks for sharing some rich family history! I used a whole caggage head (large) and 1/2 quart of cottage cheese both. Soo good, thank you Ron. looks great, mark! and i know it tasted great, too! glad you enjoyed it - if there's anything else you'd like to see, let us know, or if there's anything that you try, post it up! 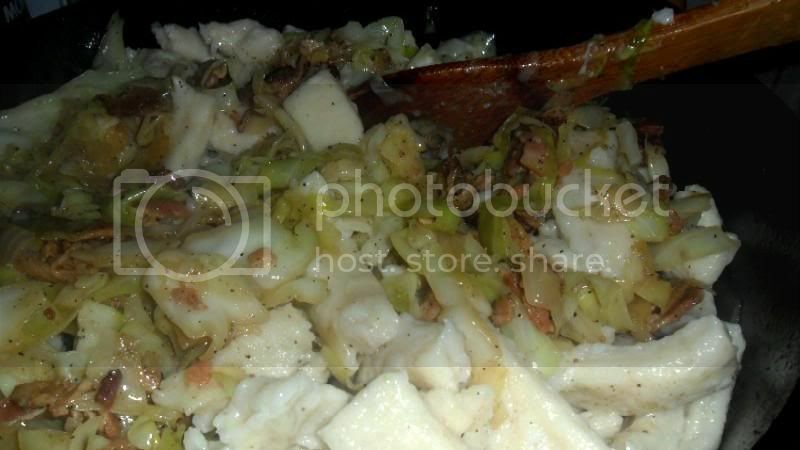 Tasunka: The halusky with cabbage was very good. We all had seconds and thirds. A definite keeper recipe. I made half the recipe and it was good for three with leftovers. Thank you! I don't think I've ever had those potato noodles/dumplings, but they sure sound good! I could go there. we made this last again last night and it was as good as ever - the beautiful mrs. tas was missing her grandmother, and so we decided to share this experience as the anniversary of her grandma's passing approached. 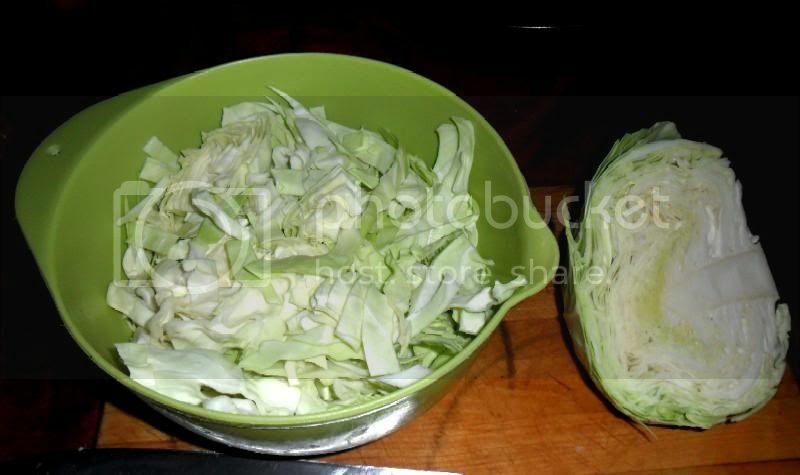 when using cabbage, the instructions above recomment cutting half the "wedges" wide and the other half of the wedges small. this works very well for getting some good texture and body. but it's even better when you cut the bottom halves of the wedges thin and narrow, and the top halves wide. this way, the tough bottom halves are made thinner and are less likely to be overly "toothsome." when we make this again, i'll get a picture to illustrate what i am saying, and will also modify the instructions above. either way works, but this, to me, was an improvement and seemed more like a natural way to cut the cabbage in order to give best results in the end product. also, we decided to give it the full "deluxe" treatment and use both cabbage AND cottage cheese. it turned out very well, and i can certainly recommend this third option, which would have been something probably reserved for very special occasions. the cottage cheese gets melty and makes a very nice creamy sauce. 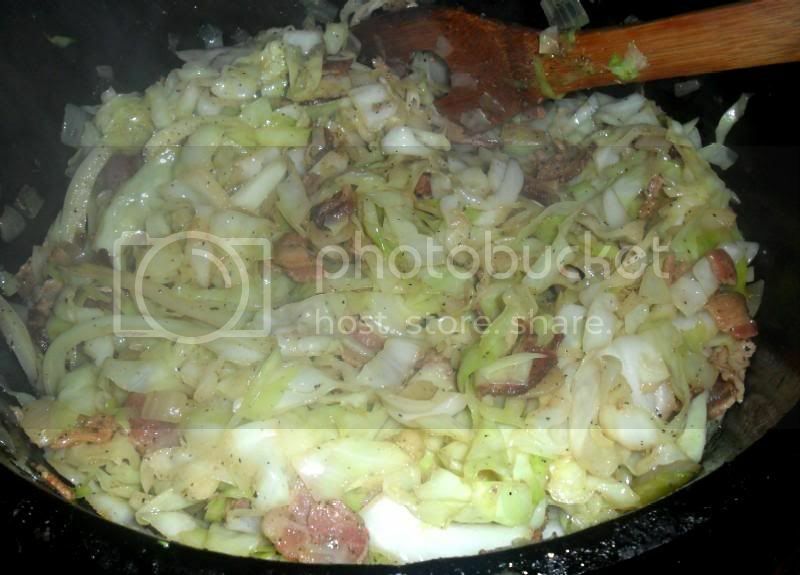 combining that with the braising of the cabbage in the bacon and the onions really gives some wonderful flavour. 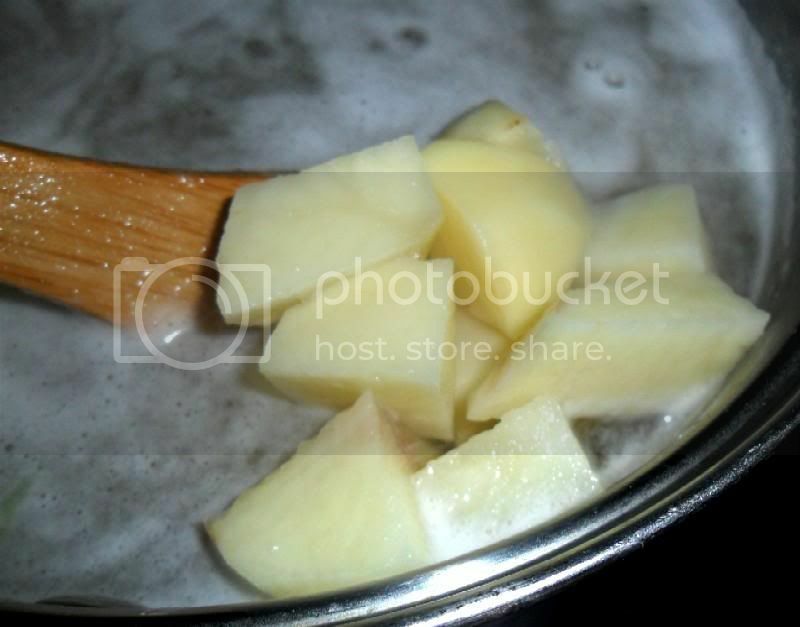 i'd really like to try making my own "pot cheese" sometime and using it for this. should be really good. O.K. Ron; here's my variation for the halusky. It is no where near as attractive as yours with the green kapusta because I had to use Red capusta. So I call it "occupation" (zamestnania) halusky. Nothing "Red" was attractive. I also adjusted a few things. 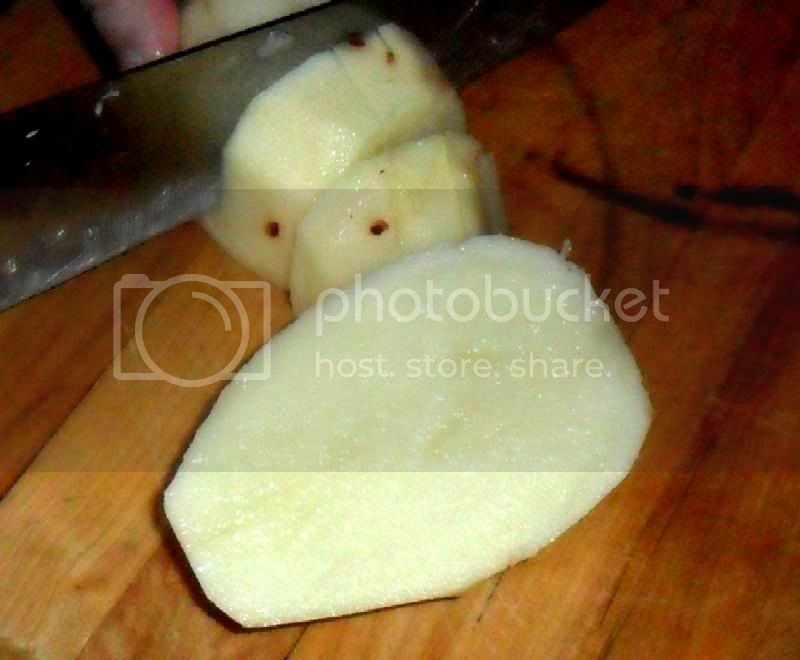 I used red potatoes and mashed them with the skin on. I like potato skins. I also added chopped garlic since the area is plagued by vampires and werewolves. I wear garlic every full moon because of my wife's parentage. One never knows; do one? 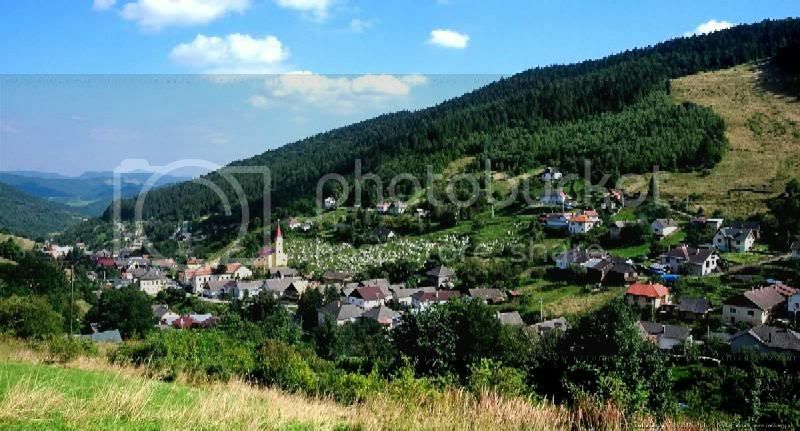 My M-I-L comes from the village of Jarambina in the district of Stara L'ubovna, Slovakia. It, with its castle, is just north of where your wife's grandmother and your recipe comes from. My M-I-L's sister's nephew, Michael Strank came from there. He was the USMC Sgt in the 2nd Iwo flag raising and didn't make it off the island. I am by occupation, a sculptor and I did this piece to commorate the 1st flag raisers who virtually faded from the pages of history. I digress. Back to the subject at hand. I pretty much followed Ron's recipe but needed 5 cups of flour; probably because of the harder red spuds? I also used Elk kielbasa. The Red kapusta, goes without saying. 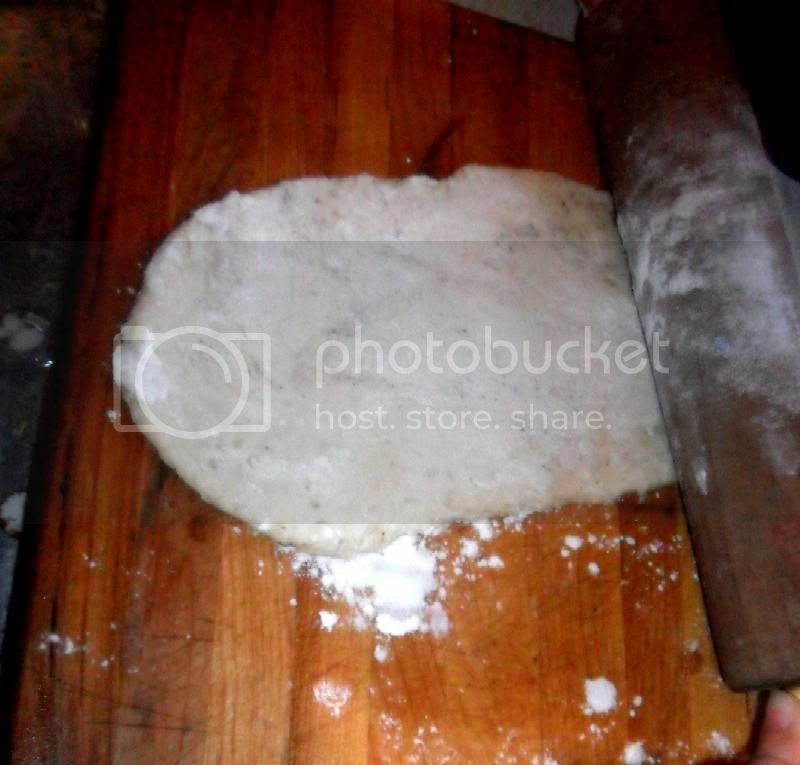 lambing knife and cutting board were my grand parents tools. My grandfather made the board for my grandmother, after they were married in 1910. The knife has always been used for kielbasa. kielbasa is poached for 8 minutes per side with water only half up the side. water is reserved and the kielbasa is browned in bacon grease and then cut into 1" chunks and fried well so that it doesn't fall apart during stirring. Meanwhile the onions are fried in bacon grease. 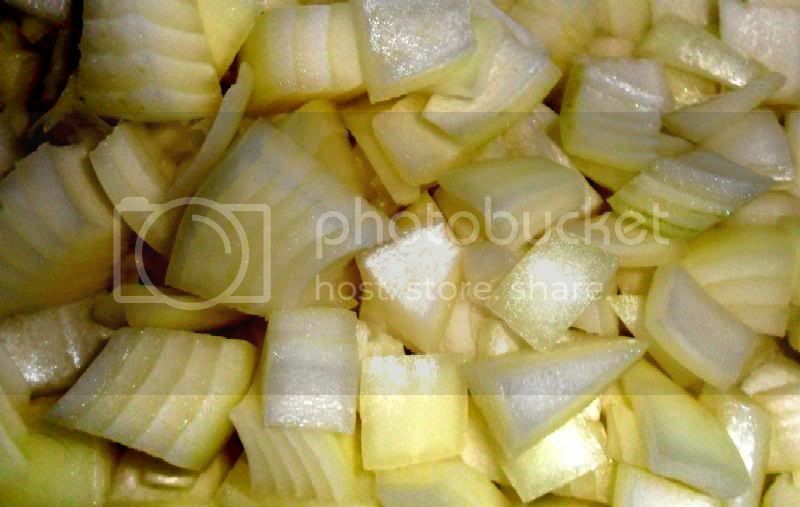 Then it is mixed in with kapusta and cibule (onion). 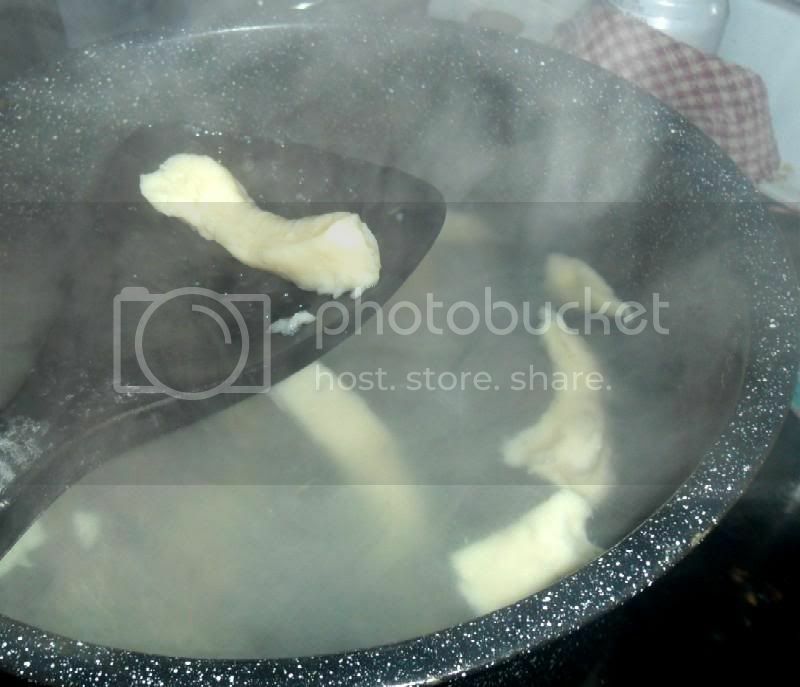 The zemiakov (potato) is boiled and the water is reserved to cook the haluski in. It adds flavour. Waste not; want not. 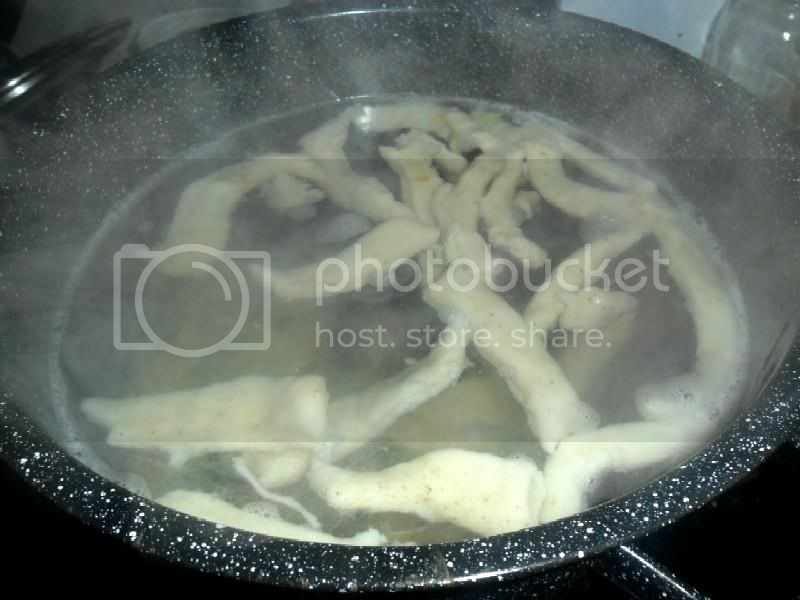 The kapusta is added and the reserved kielbasa water is added along with the frying grease rinse from the skillet. No waste of flavour. rest is academic. Halusky is rolled out, cut and drowned in the potato water. I then scoop them out and dry the pieces on racks before adding it to the kettle. ends up looking like the Red Army tromped through it but the taste is very good. I server it on our Polish plates. We have enough frozen for two more meals. I never get tired of this wonderful, simple, rustic peasant meal; it tastes great, it's easy to make and it can really stretch a dollar. We made it again last night for supper, pretty much as described in my opening post. As usual, it was delicious - and I even had leftovers for lunch today! 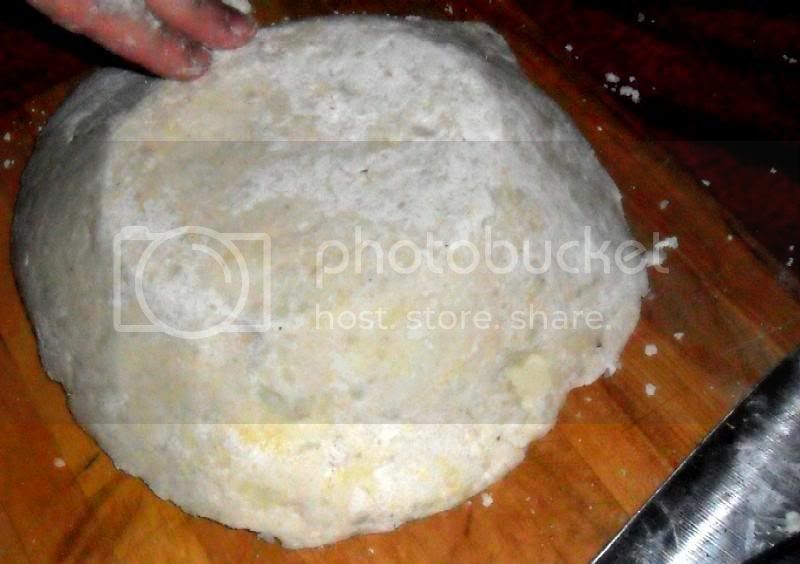 Where the halušky themselves are concerned, anyone with experience in Italian or Central European cooking can see how easy this is - it's similar to the gnocchi of Italy or the nokedli of Hungary. 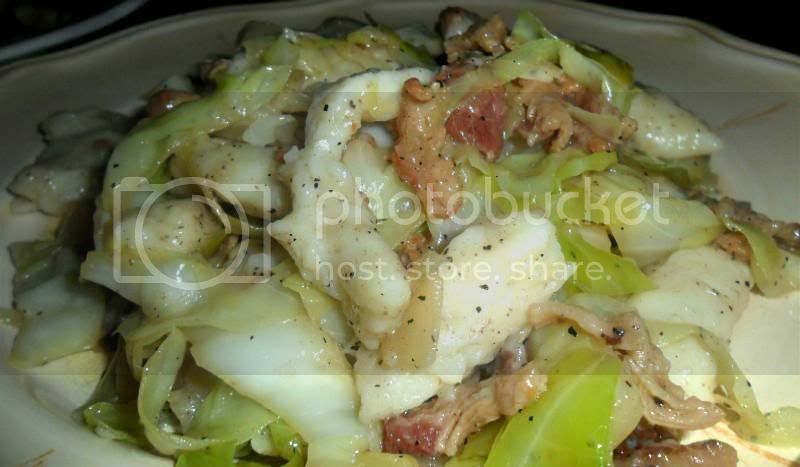 Beyond that basic component, it is a simple matter to turn this into a hearty, slavic or polish peasant meal with the bacon, onions and cabbage, giving it a character all its own that speaks of comfort, family and warm cozy evenings inside as the snow flies outside. One can prepare this with bacon, sausage, ham, chopped brisket or corned beef - or probably any other meat - or even as a meatless, vegetarian dish if desired. My oldest son, Josef, actually made the halušky, while I took care of the bacon, onions and cabbage in my Dutch oven. When he finished boiling and draining all of the halušky, we dropped them into the Dutch oven and cooked the entire mess for a few minutes, getting all of the bacony-oniony goodness into the halušky and "frying" them a bit for a little extra flavour. Just before serving, we added a small tub of large-curd cottage cheese (as a substitute for the traditional, drier "pot cheese"), stirring it around an mixing it thoroughly into the whole dish; this lent a creamy aspect to the dish that never fails to please. It is a cheap, filling, satisfying meal that is perfect for this time of year, and it is also rich in tradition and heritage - I can't really think of any "peasant" meal that is more worthy of the title. it's an important dish in our family, and will always arouse nostalgia and good memories. I'd be honoured of anyone wants to give this a try, and would be interested in hearing how you liked it. Thought this would be of interest, from www.slovakcooking.com. Firstly, thanks so much for sharing your traditional family recipe. 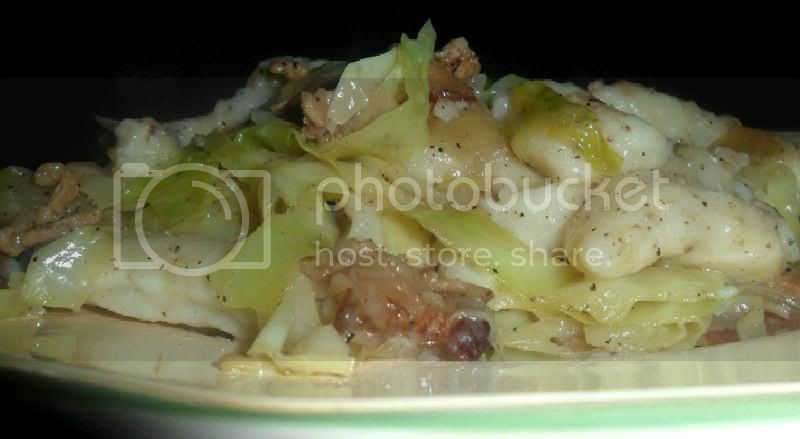 I am going to prepare your family recipe this wkend, as we have enjoyed similar pastoral cabbage dishes in northeastern Austrian Italia, Trentino Alto Adige ( Trieste ) as you know. 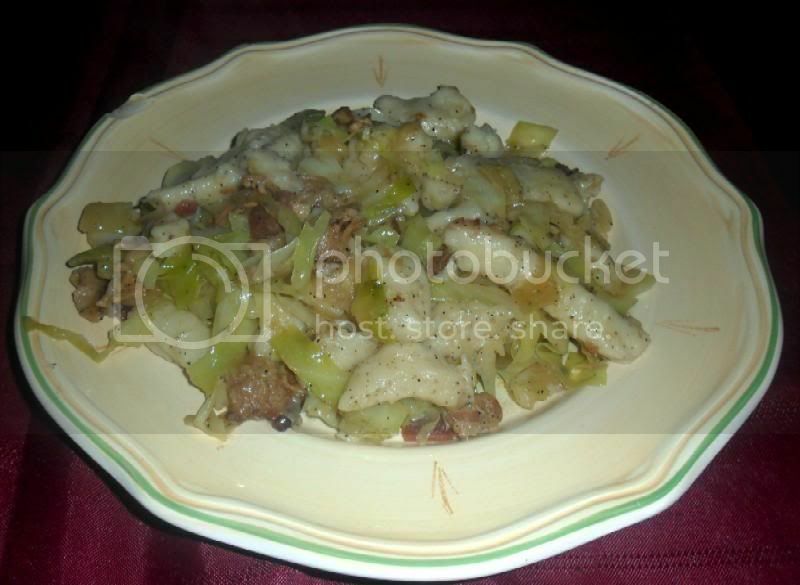 I would like to prepare it with my fave potato called cachuelos from Galicia. They are extraordinaire and we love curly cabbage dark green or Cavolo, an Italian black cabbage. Now, the bacon or the Kielbasa: I want a Butcher slab of sausage not a pkg. and a good red wine to sip with this. I truly love the idea, with a Bratwürst / Kielbasa and am thinking since it is HUNTERS SEASON, perhaps a Venison or Boar Sausage verses a Porker which are both available here in El Corte Ingles ( www.elcorteingles.es ) the Interntl. Supermkt. Tas: what do you think or should I stay with Bratwürst or Kielbasa ? So be patient, I shall definitely prepare it however, I need the right ingredients; and I shall post a couple of fotos and enjoy preparing in my freetime. 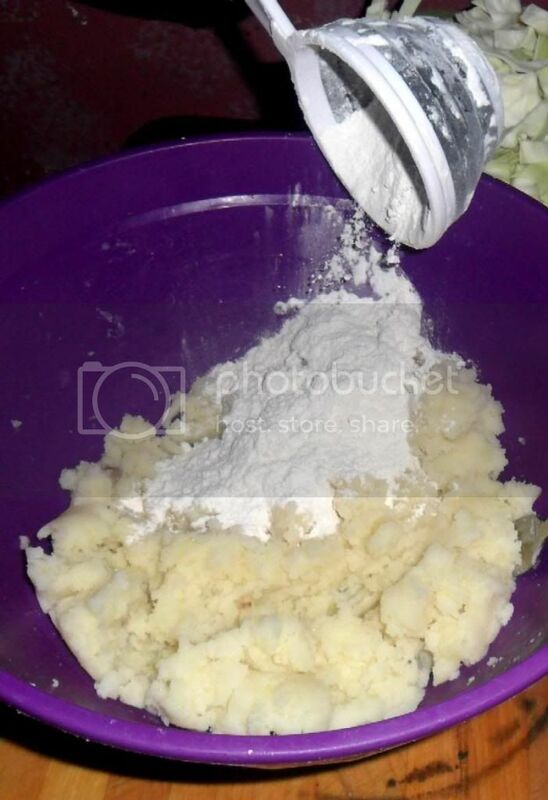 The potato dumpling instructions u have provided are simple and concise to follow. 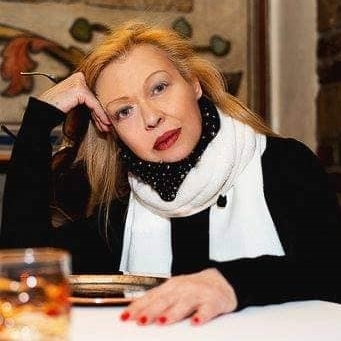 One more thing, the photos that are accompanying your recipe, the Photos of your Mother In Law and the countryside and the lovely photos of the statue, artist and scenery -- are they Rod´s ? or Your´s ? Good morning, Margi, and thank you for the very interesting link, with the insightful photos. 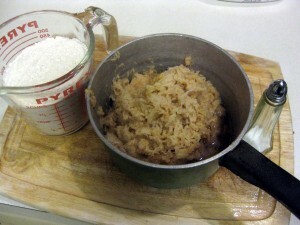 The photos of the preparation of the recipe in the opening post, starting with the shot of the ingredients, are indeed mine. 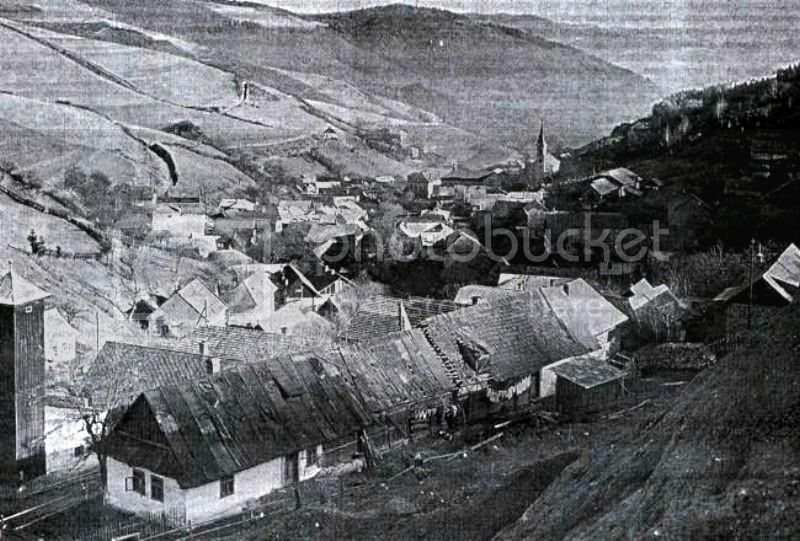 The ones above it of the town of Zakarovce are a selection that I found on the internet in order to introduce the reader to my Grandmother-in-Law's hometown. The photos in the later post farther down with the statue, the red cabbage and the WW2 soldiers are actually from another fellow. If you read the opening of that post closely, you'll see that I was simply quoting another person who tried this recipe and enjoyed it. I'm honoured that you're going to give this a try. It truly is one recipe that has become a family tradition, and I am proud that all of my children will know how to make it. 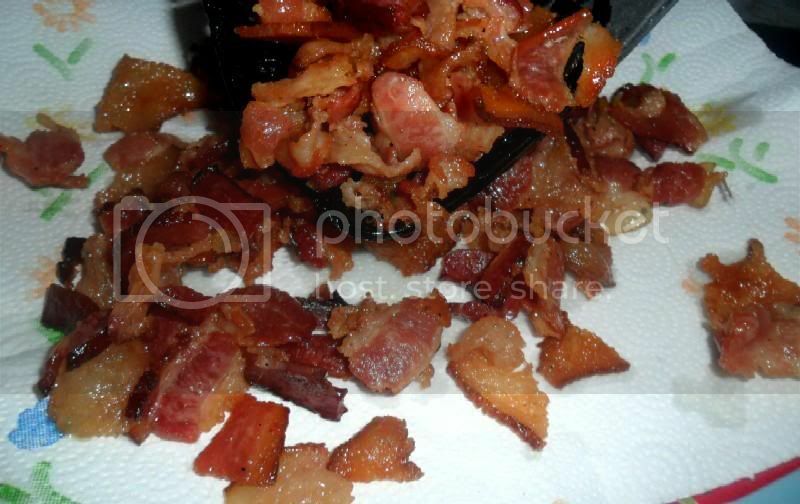 For me, BACON is absolutely the way to go - if you decide to go with bacon, it should definitely be sliced thick, and cooked over medium heat in a heavy pan so that the fat can be rendered as much as possible. Not to the point where the bacon is burned or crispy, but....well-rendered. But having said that, this is a very versatile recipe and therefore it is open to preferences and available ingredinets; thus, ham or sausage would not only be perfectly acceptable, but also would, I believe, be just as traditional. This is peasant cooking after all, so one would use what they had, which unfortunately might often have meant that only the most meager organ meats or even no meat was available. So with that, I say, if you want sausage, it's all good! I think that, if you are going with a sausage, that the kiełbasa-type would be the most versatile way to go. I'm no expert, but my reading indicates that the area of Slovakia where Zakarovce is located was closely aligned with the Hungarian Empire culturally. It wouldn't surprise me if Hungarian kolbász, assuming you can get some, might be the most "relevant" choice; but having said that, either would be great, whichever you choose. Any German wurst would be fine, as well - all of these sausages are similar, and to be honest I think that any would do just fine. One important characteristic, in my opinion, is that the meat, whatever you choose, be cured and smoked, because this imparts a wonderful flavour to the dish that really makes it special. I have no experience with boar sausages, but if you like them, and want to give a rustic flavour to the dish, it certainly can't hurt! Same with venison sausage, which should be quite good for this. For me, the choice would come down whether I wanted to keep it traditional, or whether I wanted to push the envelope and put an individual or regional flair on it. For me, since it is a significant family thing, and I actually knew and interacted with (and even loved) the woman who inspired this recipe, I would want to make it as close to the way she had it as possible - and, if I could, I would reach as far back to the little village of her birth as possible, given my limited availability of ingredients. But, if you are able to put an Iberian twist to it or incorporate some of your own favourite ingredients (such as the potatoes and the cabbage), then I think it would be great to go with a favourite Iberian smoked sausage as well, which would really make the dish stand out on its own with a unique character and a new identity.